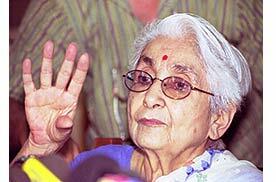 The first woman candidate to contest the post of India's President, the Left parties' nominee, Dr [Colonel] Lakshmi Sehgal, ranks among the legends of the Indian freedom struggle. An associate of Netaji Subhas Chandra Bose, she led the Indian National Army's Rani Jhansi regiment. After Independence she started practicing medicine in Kanpur, became active in Left politics after the 1971 war and was awarded the Padma Vibhushan in 1998. Touring the country to garner support for her candidature, Sehgal, who will turn 88 on September 24, looked relaxed at the Bihar state guest house in Patna after a busy day-long schedule. Without any hesitation or formality, she shared her views with Anand Mohan Sahay about the state of India and where it is headed. Why did you call the National Democratic Alliance nominee for the Presidency, A P J Abdul Kalam, a puppet in the hands of Hindutva forces? A P J Abdul Kalam is really a putla or puppet in the hands of Hindutva forces represented by the Sangh Parivar and the BJP as its political front because till date he has not condemned the Gujarat incident. Nor has he visited Gujarat where hundreds of innocent Indian were killed. Besides, the BJP has fielded Kalam to hide its crime in Gujarat and to change its anti Muslim image. But it is not going their way, the people realise that Kalam is the BJP's puppet. You will be surprised to know that recently Kalam was forced by Sangh Parivar watchers not to speak in his mother tongue Tamil during an interview with Sun TV, a Tamil channel. This was told to me by the Sun TV staff who interviewed me. The RSS and other Sangh Parivar outfits are supporting Kalam because for them he is their dream Muslim who is vegetarian, a bachelor, a reader of the Gita instead of Quran, with a Natraj idol and what not. Dr Kalam may be an ideal Muslim for the Sangh Parivar, but he is not a Muslim like millions of Muslims in India. Dr Kalam is supported by almost all political parties except the Left Front. Yes, this is why I am here and contesting against this person. The fire inside me to safeguard Indian interests has forced me to contest against the BJP candidate, A P J Abdul Kalam. I was a fauji [soldier], we never fight to win or lose, and I am fighting for a cause. Unlike Kalam we have to prove our stand on all issues concerning India. What is your grievance towards the BJP and Hindutva forces? The BJP is trying to destroy communal harmony which may threaten our national unity and integrity. In fact, the BJP's Hindutva will kill the Hinduism of millions of Indian including us. The BJP's one point agenda of pseudo nationalism is harming the country's interest and giving a bad name to the country outside. What happened in Gujarat is not a fact to hide from the world media. How do you see the Gujarat incident after your visit to relief camps there? Today, Gujarat is the most painful thing for the idea and dream of Netaji Subhas Chandra Bose. Netaji always stood for communal harmony with no discrimination on caste and religious grounds which is unfortunately happening in Gujarat. What is your reaction to the suggestion made by the Rashtriya Swayamsevak Sangh and Vishwa Hindu Parishad to divide Jammu and Kashmir? The division of Jammu and Kashmir is the thought of an anti national. By suggesting the division of Jammu and Kashmir, the RSS and VHP have proved that they are pseudo nationalists. The division of Jammu and Kashmir on religious grounds is the worst thing for India's national unity and integration because it will communalise the situation in India further. The outfit demanding the division of the crown [Jammu & Kashmir] of India is not only the betrayal of the freedom struggle won by Indians, it is also an anti national act. It is a wrong perception that the two nation theory was invented by Mohammad Ali Jinnah who founded Pakistan, the fact is that RSS and Hindu Mahasabha leaders were the first to raise the issue of the two nation theory in the early twentieth century. On the basis of this today, the RSS and VHP are demanding the division of Jammu and Kashmir into three or four parts. What will be the consequence of the division of Jammu and Kashmir on religious lines? The division of Jammu and Kashmir on the two nation theory will lead to the disintegration of India. Nobody would be able to safeguard its unity after that blunder. The separatist movement will get a moral boost from Khalistan to the northeastern states. What is the solution to the Kashmir problem? More autonomy not only for Jammu and Kashmir but to all states. By strengthening federalism India will become stronger than ever. If we give more autonomy to Jammu and Kashmir, do developmental work and have pro-people policies instead of turning it into an army camp, we may pave the way for resolving the Kashmir crisis. The people of Jammu and Kashmir have always wanted to remain in India except a few. During the last fifty years the Kashmiri people helped the Indian army in the time of war with Pakistan. In fact, they are no less Indian than any one. It is unfortunate that they have been seen with suspicion which alienated them. What about dialogue with Pakistan to resolve the Kashmir issue? Dialogue must be continued, it should not be stopped. If we stop talking with Pakistan it will further complicate the matter of solving the Kashmir problem. War is not a solution, it has not solved any problem in world history. You mean to say dialogue with Pakistan should not be stopped. Yes, why should we stop dialogue with a neighbouring country like Pakistan? Unfortunately in the last three years, Prime Minister Atal Bihari Vajpayee sometimes behaves like a friend with an over zeal to improve relations with Pakistan, at other times he behaves arrogantly. It will not work. We have to prepare ourselves before holding an Agra type summit with Pakistan and discuss every issue carefully and with minute to minute progress. It is alleged that America is dictating terms to the Vajpayee government over Kashmir and other issues. This government is working under American pressure that is why it is reflected everywhere. Netaji told us that more than political freedom, economic freedom is important to function like a free people. Today apparently America is posing as super boss in the economic front. This government has even opened FDI in the print media.